The Baltic countries are a unique spot of land on the Eastern shores of the Baltic see which has not yet been completely invaded by the “modern civilization”. Where else in Europe it is possible to walk tens of kilometers along sandy beach without meeting a single soul? Or ride your bicycle on quiet roads through forests for hours without seeing a car? Or go boating down a naturally meandering river with red sandstone rocks lining its bank and birds singing unseen in the trees. 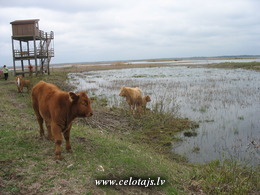 In the Baltics, one can still see tens and hundreds of plant, animal and bird species and their habitats which are extinct or rare in modern Europe. Our touring routes will take you through nature protected areas (e.g., national parks, protected landscape areas, nature parks etc.) – the ones of the utmost natural beauty. Meny of these sites are part of network of nature protected areas of European importance - Natura 2000. What special about these sites and why they are protected - read in the section of Protected nature areas. And during your trip please protect the nature - read and follow our Green Advice for Travellers!